Today is the feast of St Dismas, the Penitent Thief. This year (2016), today is Good Friday, so it’s an excellent day to commemorate Dismas. The Penitent Thief, also known as the Good Thief or the Thief on the Cross, is one of two unnamed men mentioned in several versions of the crucifixion of Jesus in the Greek Bible. In the accounts in the Gospel of Mark and Gospel of Matthew, these two join the crowd in mocking Jesus. The Gospel of Luke describes one asking Jesus to “remember him” when Jesus will have “come into” his kingdom. The other, known from this account as the Impenitent thief, asks Jesus why he cannot save himself. He is given the name “Dismas” in the Gospel of Nicodemus and, though not formally canonized by the Catholic Church, is venerated in some Catholic traditions as “St. Dismas” (sometimes “Dysmas”, or, in Spanish and Portuguese, “Dimas”). Other traditions have bestowed other names, including Titus, Demas, Rakh, and Zoatham. The phrase translated “today … in paradise” in Luke 23:43 (“Αμήν λέγω σήμερα θα είσαι μαζί μου στον Παράδεισο.”) is disputed in a minority of versions and commentaries. The Greek manuscripts are without punctuation, so attribution of the adverb “today” to the verb “be”, as “be in paradise today” (the majority view), or the verb “say”, as “today I say” (the minority view), is dependent on analysis of word order conventions in Koine Greek. The majority of ancient Bible translations also follow the majority view, with only the Aramaic Curetonian Gospels offering weight to the minority view. This seems to be a minor quibble to me. Jesus is asserting that the penitent thief will attain paradise. Whether he will go there “today” or Jesus was simply saying it “today” is not important to me. The point is that a condemned criminal is the only person we know of who was confirmed as a saint by Jesus himself. Only the Gospel of Luke describes one of the thieves as penitent, and does not name him. According to tradition, the Good Thief was crucified to Jesus’ right hand and the other thief was crucified to his left. For this reason, depictions of the crucifixion often show Jesus’ head inclined to his right, showing his acceptance of the Good Thief. In the Russian Orthodox Church, both crucifixes and crosses are usually made with three bars: the top one, representing the titulus (the inscription that Pontius Pilate wrote and was nailed above Jesus’ head); the longer crossbar on which Jesus’ hands were nailed; and a slanted bar at the bottom representing the footrest to which Jesus’ feet were nailed. The footrest is slanted, pointing up towards the Good Thief, and pointing down towards the other. The thief’s conversion is sometimes given as an example of the necessary steps one must take to arrive at salvation through Christ: awareness of personal sin, repentance of sin, acceptance of Christ and salvation’s promise of eternal life. Further, the argument is presented that baptism is not necessary for salvation since the thief had no opportunity for it. Luke’s unnamed penitent thief was later assigned the name Dismas in the Gospel of Nicodemus, portions of which may be dated to the 4th century. The name “Dismas” was adapted from a Greek word meaning “sunset” or “death”. The other thief’s name is given as Gestas. 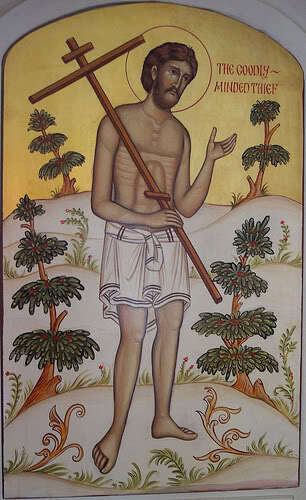 In Coptic Orthodox tradition he is named Demas. This is the name given to him in the Narrative of Joseph of Arimathea. The Arabic Infancy Gospel calls the two thieves Titus and Dumachus, and adds a tale about how Titus (the good one) prevented the other thieves in his company from robbing Mary and Joseph during their Flight into Egypt. A number of towns, including San Dimas, California, are named after him. There also exist parish churches named after him, such as the Church of the Good Thief in Kingston, Ontario, Canada—built by convicts at Kingston Penitentiary, Saint Dismas Church in Waukegan, Illinois, the Old Catholic Parish of St Dismas in Coseley and the Church of St. Dismas, the Good Thief a Roman Catholic church at the Clinton Correctional Facility in Dannemora, New York. In medieval art, St Dismas is often depicted as accompanying Jesus in the Harrowing of Hell as related in 1 Peter 3:19–20 and the Apostles’ Creed (though neither text mentions the thief). 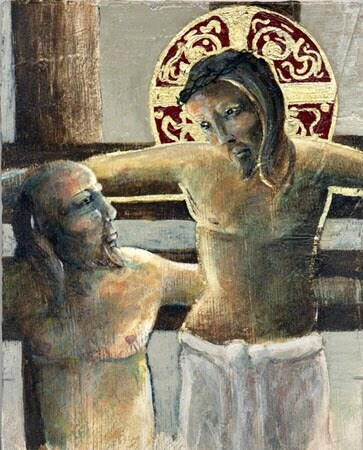 In the Eastern Orthodox Church, one of the hymns of Good Friday is entitled, The Good Thief (or The Wise Thief, Church Slavonic: Razboinika blagorazumnago), and speaks of how Christ granted Dismas Paradise. There are several compositions of this hymn which are used in the Russian Orthodox Church and form one of the highlights of the Matins service on Good Friday. 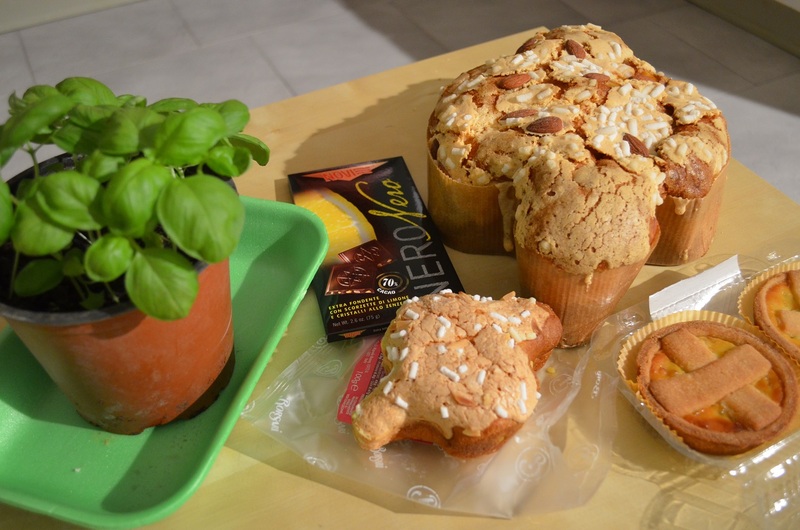 Good Friday and the crucifixion have spawned a lot of special foods. Here’s my spread for the day of northern Italian specialties. If I were in England I’d be noshing on hot cross buns. For breakfast today I made something special with unleavened bread and olives (with cheese). 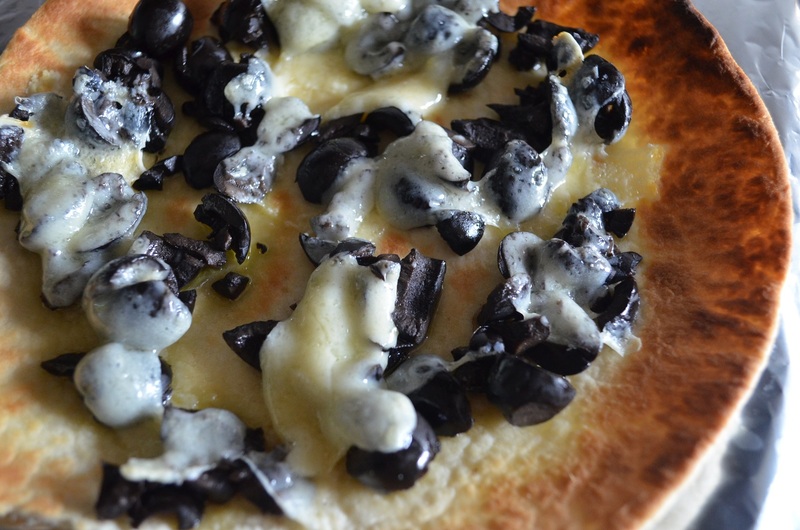 The unleavened bread is a reminder of Passover, and the olives are a reminder of the Mount of Olives in Jerusalem. This creation of mine is actually similar to a number of dishes found in the Mediterranean. Preheat the broiler and warm flat bread under it for a couple of minutes. Sprinkle the bread with extra virgin olive oil, and then a layer of chopped black olives. Top with thin slices of sharp cheese and broil until the cheese melts.